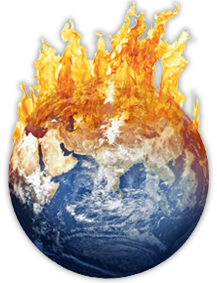 According to NASA, the hottest year on record was 2005, which matched 1998. Twice in the last ten years, we've had the hottest temperatures on average ever recorded in our planet's history. That is very likely more than just a coincidence. In fact, the past nine years have all been among the 25 warmest years on record, a streak which is unprecedented in the historical record. For that to happen, it's likely there has to be an underlying factor, and that factor seems to be global warming. U.S. and global annual temperatures are now around 1.0 F degrees warmer than they were in 1900. The rate of warming has accelerated over the past 30 years, increasing at a rate of three times faster than the century-scale trend. It's likely the increase in CO2 emissions has something to do with that rate increase. According to an MIT study, there's been a 100% increase in the intensity and duration of hurricanes and tropical storms since the 1970s, most likely due to the increased amount of CO2 emissions to our atmosphere, which has increased the Earth's surface temperature, and warmer weather is believed to increase the intensity of tropical storms and hurricanes. In fact, the levels of atmospheric carbon dioxide has increased by 31% between 1800 and 2000, going from 280 parts per million to 367 parts per million. Scientists predict that carbon dioxide levels could be as high as 970 parts per million by the year 2100. According to the National Climactic Data Centre estimates, $100 billion of damage was caused by hurricanes hitting the U.S. coast in 2005 alone. The increase in severity of the hurricanes and tropical storms is most likely due to the increase of CO2 emissions, which heats up the Earth's near-surface temperatures. In fact, the average surface temperature has increased by about 0.6 C (1.0 F) over the last 100 years. This is likely why snow cover and ice extent have decreased over the past few decades. According to the U.S. Geological Survey predictions, Glacier National Park will have no glaciers left by the year 2030, further showing the rapidity of global warming and the impact it can have on our planet in the very near future. According to the Arctic Climate Impact Assessment, 400,000 square miles of Arctic sea ice have melted, which is threatening polar bear habitats and further accelerating global warming worldwide. That amount of Arctic sea ice is approximately the size of the state of Texas, and we've lost that in just the last 30 years, further emphasizing that we need to take action now before the damage becomes too severe for our efforts to really matter. The sea level has risen by 4?-8? (10-20 cm) over the past 100 years, which is likely due to the melting of the polar glaciers, which is likely due to the increase in the Earth's near-surface temperature, and that's being increased by the increase in CO2 emissions into Earth's atmosphere. This can lead to devastating effects for coastal communities because the sea level is rising, which means that when the sea comes in-tide, more erosion can occur, and if coastal communities are present, more damage done to them. In addition, losing the glaciers reduces the amount of usable fresh water on our planet. It is also projected that 15-37% of all plant and animal species could be wiped out by global warming by the year 2050, which could further cause considerable damage to our planet's ecosystem. The United States is ranked nr.1 among large nations of being a global warming polluter, contributing 25% of emissions, even though the U.S. only makes up 5% of the world's population. This provides more evidence that the U.S. Government must do more to combat global warming. In fact, six former U.S. Environmental Protection Agency (EPA) leaders say that the U.S. is not doing enough to fight global warming. The fact that there have been NO bills passed by the U.S. Congress to cut global warming pollution further confirms what many EPA leaders are saying. As you can see, there is statistical evidence that proves that global warming is causing changes to our planet, and changes that will do more harm than good. Governments and individuals need to pay close attention to these statistics in order to figure out ways to reverse the disturbing trends that are now occurring. The sooner we take heed of these statistics and implement changes that address global warming, the quicker we can reverse the disturbing trends and the less damage will occur to our planet and way of life.